Today we “kicked-off” our Read-A-Thon! Everyone has been out collecting sponsors for the challenge they have set themselves to read – some people are trying to read more than 600 minutes over the next two weeks! A couple of people are trying to read more than 1,000 minutes! All of our reading efforts are to help raise money for the After The Wave Foundation and the 8 students that Grade 3 sponsors every year from R35 School. Some great researching and thinking was done in our Author Study Unit that we finished last week. In class we learned and noticed things that Chris Van Allsburg does as an author and in groups we looked closely at Cynthia Rylant, Tomie de Paola, Margaret Mahy and Gail Gibbons. We decided to share our new learning and noticings about these authors in our group Author Study VoiceThreads below. Have a listen – they’re very informative! Please leave us a comment on the actual VoiceThread if you would like to. We’d love to hear your thoughts! 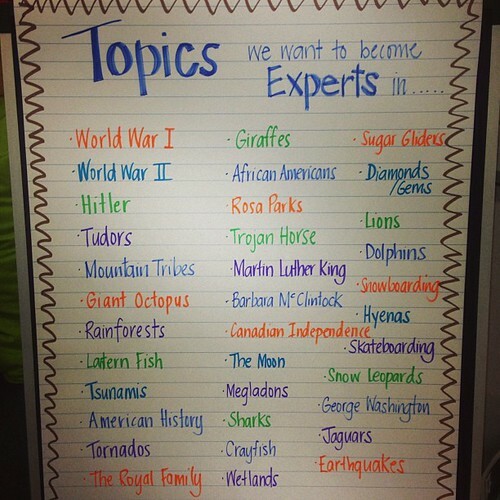 Look at all the topics we want to become experts in! to about our chosen topic. Parents, please talk with us about our questions and help us look for some appropriate sources on the internet to help us. We will need some help with keywords to help us search for websites. In your reading notebooks, write a draft letter convincing a reader to read a mystery book that you have already read, and of course, one that you have enjoyed. See the example below to help you with what your letter should sound like. Please see important reminder below too! Don’t forget to fill out our online Reading Log whenever you finish a book! Many people are forgetting to do this. You can find the link to the Reading Log at the top of our blog where all the pages are. There have been some mysterious goings-on in Room 207 but not to worry! Our team of Daring Detectives are on to it! We will get to the bottom of all mysteries I’m sure! Hello Room 207 students! Here are the details of the NonFiction Project that I told you about today during Reading Workshop. Remember that I will be showing you how to create a copy of the Google Presentation Project Master for the topic that you have chosen to teach us all about. You do not need to start this project until we have done this together. You can keep coming back to this presentation to check that you have completed all the things that your project needs before the final project due date: Friday 16th November. The great thing about Google Docs Presentations is that you can work on them at home – just log into your google account like I showed you in class! Use the link on the sidebar of our class blog under Learning Links to go to Google Docs. (Remember your email address and your super-secure password with a capital and number). I know that we are all looking forward to creating our topic presentations and seeing each others creations! Have fun and enjoy this project – and don’t hesitate to ask me any questions you have – I will be leaving you comments on your projects as you are working on them too!